Matt Garza probably thought he was through the sixth inning of Tuesday’s game against the Reds when Miguel Cairo stepped into the batters box. He definitely thought he was after Cairo waved at a slider in the dirt with two strikes. But then all of this happened. In the box score and the play logs, it goes down as a simple dropped third strike, but clearly there is more to the story. Let’s break down perhaps the most “Chicago Cubs” play of the season so far. Thanks to the commenters drew and Rick for pointing out a rule that I missed. Check out an update after the conclusion of the original story. The key here appears to be that nobody on the Cubs was actually watching the home plate umpire, or if they were, they didn’t pay attention to the right things. 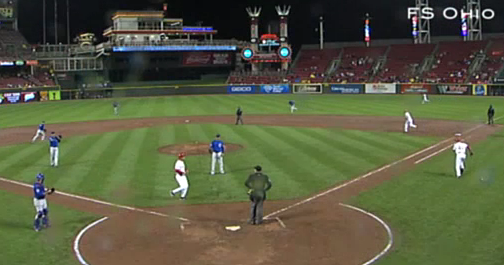 The ump did signal that Cairo failed to check his swing, right here at 0:06 in the video. It would be easy to interpret this signal as an out call, but this signal only means that Cairo swung. The umpire never gave an “out” signal with a closed fist, and as a result the ball is still live. Cairo never realized this either, and as the umpires doesn’t have the responsibility of notifying everybody that the ball is live, the mass confusion eventually resulted in everybody heading towards their respective dugouts. There was no tag attempt, so Cairo can’t be declared out of his baseline. And since Cairo had not touched first base, at least according to the strictest of rulebook definitions, he can’t be called out for abandoning the bases. If he had reached the dugout, leaving the field of play, then he would be out, I assume (although I can’t seem to find anywhere specifically indicating this in the rulebook — I can’t imagine the catcher would have to chase him into the dugout, would he?). The fact that Cairo didn’t run immediately allowed him the opportunity to run to first and for Ramon Hernandez, the runner on first, to head to second. With the second baseman and shortstop headed to the dugout, Hernandez had plenty of time to make it to second before the force applied, and of course nobody was getting Cairo at first either. 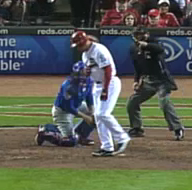 Luckily for the Cubs, Garza managed to strike Drew Stubbs out on the next play, and there was no damage. The Cubs certainly managed to shoot themselves in the foot on more than one occasion in this game — all seven of the Reds runs were unearned. This one was just one of many odd plays in arguably the sloppiest game of the year. At least, I would assume that this was how the umpires would defend their ruling last night. However, they appear to have missed rule number 6.09b. So it turns out my interpretation of the above play is incorrect, and the umpires got it wrong. I would imagine that they interpreted the play as in Rule 7.08. Personally, I really would’ve liked to hear the argument between Cubs’ manager Mike Quade and the home plate umpire and hear the justification for the ruling on the field. We hoped you liked reading Baseball Oddity Files: Cubs Bungle Dropped Third Strike, Thanks to Umpire Error by Jack Moore! Changes Coming For The NL Central? Didn’t this happen with AJ Pierzynski in the playoffs a few years back? I could’ve sworn they changed the rule to note that as soon as a batter starts to head toward the dugout after a third strike call, they’re declared out. Am I going crazy or can anyone else check my sanity and remember that? Correct on all counts. The rule used to read that the batter was not out till he set foot on the dugout steps. It was changed in the off season after 2005.